This "Historically Speaking" column appeared in the Exeter News-Letter on Friday, August 17, 2012. “No movement could be more aptly named than the Crusade for Freedom,” reads the editorial in the Exeter News-Letter in the summer of 1951, “signifying a united effort of millions of Americans, aided by exiles and peoples who have fled from their homes in the Iron Curtain countries, to combat the tyranny and insidious practices of the Communist regimes behind the Curtain in these countries.” In the six years since the end of World War II, Americans watched in disbelief as our former ally, the Soviet Union, devoured much of Eastern Europe and cut off communications. Winston Churchill’s observation in his 1946 speech that “an iron curtain has descended across the continent” set the tone for post-war relations: the boundary barring basic rights had to be crossed. It wasn’t just the social isolation of Eastern Europe that troubled the West, it was the suppression of ideas and progress that were dangerous. In a world that now had the ability to destroy itself quickly with nuclear weapons, diplomacy was vital and free speech essential. But how could this be achieved? After the war, thousands of displaced people in Europe found themselves living far from their homelands, unable to return after communist regimes had taken control. The U.S. government encouraged many of these people to aid in the move to bring democracy back to Eastern Europe through writing and broadcasting in their native languages. Radio Free Europe was created in 1949 by the National Committee for a Free Europe (hereafter NCFE) to broadcast news of world to the Soviet Block countries. 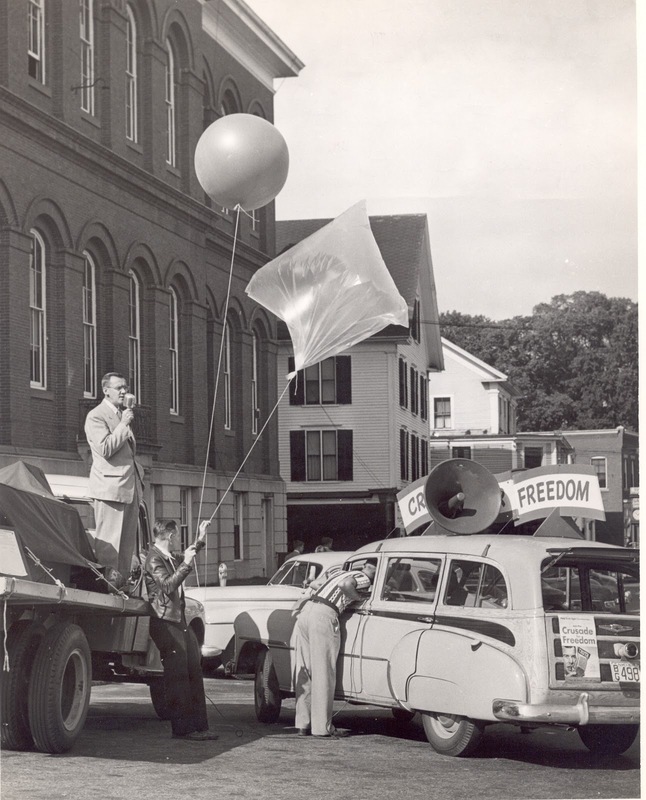 For those areas that could not receive radio signals, or didn’t have access to a radio, pamphlets were airlifted by surplus weather balloons. Although the radio signals were frequently jammed, the mix of high and low technology made the system difficult for the Soviets to circumvent. 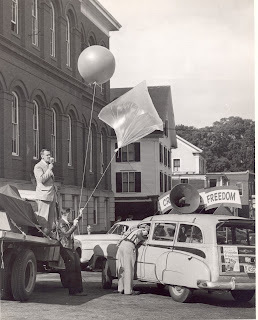 The Crusade for Freedom began a publicity campaign featuring a motorcade and demonstrations of the balloon-carrying leaflets. Citizens were encouraged to read the leaflets – often the pamphlet entitled “Winds of Freedom” and report where they were found and the place of origin. One, which was sent aloft in Reno was later recovered in Nebraska. The success of the crusade in Exeter was never reported. Likely it reflected the same rates as the rest of the country. During the 1951 campaign, the Crusade of Freedom never managed to reach its goal – but it did net nearly two million dollars, no small chunk of change. There was no mention of where the balloons launched in Exeter landed – given the prevailing winds, they most likely drifted out to sea over Hampton and Seabrook. Radio Free Europe, even after it was no longer supported by the CIA, proved to be a success. Broadcasting was a dangerous proposition for those involved – the Soviets were keen to shut down the system through jamming, intimidation and occasional bombing, but the programs continued to be broadcast until the fall of European Communism in 1991.